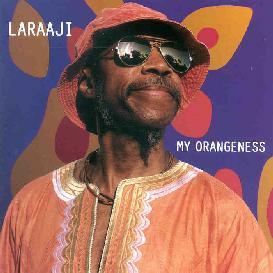 Laraaji is a NYC performer who has worked with Bill Lazwell, Bill Nelson, Brian Eno and others over the years. This CD was recorded in Italy in 1999, following Laraaji's performance at the Space Festival in Italy in 1998. This festival was a spiritual event bringing forth many different artists and forging new musical and spiritual collaborations. Laraaji sings, chants and plays Zyther and percussion and is backed by a group of Italian musicians playing drums, guitar, electronics, keyboards and violin. The opening track ("Cosmic Joe") is a New Age adventure song with a great cosmic lyrics. Marmelade Eyes has a very laid back spacey improvisational jazzy feel to it. The next several tracks are very cosmic and relaxing, just floating. I like the way Laraaji mixes in some African influences and some chanting. This is right on the edge of where I might think it is getting a little too New Age for my musical tastes, but this was a very enjoyable release. For more information you can visit the Vel Net web site at: http://www.vel-net.com. Contact via snail mail c/o Vel Net; Via Putignani 210; 70122 Bari; Italy.